Background: Parkinson disease (PD) is a progressive neurodegenerative disorder in which the major pathologic substrate is a loss of dopaminergic neurons from the lateral substantia nigra pars compacta (SNc). Our objective was to determine whether, in patients with early PD, SNc changes evident on MRI sequences sensitive to iron content corresponded anatomically to the pathologic changes reported previously, and to correlate these changes to the duration and severity of clinical manifestations of PD. Methods: Twenty-six untreated patients with early PD and 13 age- and gender-matched control subjects had MRI with a 3 tesla magnet using a multiple gradient echo sequence designed for rapid single-scan mapping of the proton transverse relaxation rate (R2*). R2* was calculated for midbrain and forebrain basal ganglia regions. Clinical features were rated with the Unified Parkinson's Disease Rating Scale. Results: A difference in measured R2* values between patients and controls was observed in the lateral SNc (p ≤ 0.005). Linear regression indicated a correlation between the lateralized motor score from the clinically most affected side and R2* values from the opposite lateral SNc (p = 0.01). Conclusions: High field strength MRI demonstrates lateral substantia nigra pars compacta abnormalities in early Parkinson disease (PD) consistent with increased iron content and corresponding to the known distribution of neuronal loss occurring in this disorder. This may ultimately provide an imaging marker for disease progression in PD, although longitudinal studies are required. GLOSSARY: AC = anterior commissure; CN = caudate nucleus; GP = globus pallidus; LantGP = left anterior GP; LantPu = left anterior Pu; LlatSNc = left lateral SNc; LlatSNr = left lateral SNr; LmedSNc = left medial SNc; LmedSNr = left medial SNr; LpostGP = left posterior GP; LpostPu = left posterior Pu; PC = posterior commissure; PD = Parkinson disease; Pu = putamen; RantGP = right anterior GP; RantPu = right anterior Pu; RlatSNc = right lateral SNc; RlatSNr = right lateral SNr; RmedSNc = right medial SNc; RmedSNr = right medial SNr; RN = red nucleus; ROI = region of interest; RpostGP = right posterior GP; RpostPu = right posterior Pu; SNc = substantia nigra compacta; SNr = substantia nigra reticulata; TE = echo times; UPDRS = Unified Parkinson's Disease Rating Scale. The primary objective of the present study was to assess changes in midbrain iron content occurring in patients with early PD not yet receiving symptomatic medical treatment. We applied a modification of a method previously developed in our laboratory11,12 to determine whether SNc changes evident on high-field MRI (3 tesla) corresponded anatomically to the neuropathologic changes reported previously.1 This method was designed to minimize the magnetic field inhomogeneities that arise from tissue-tissue and air-tissue interfaces, thereby improving the specificity of transverse relaxation measurements for changes in iron content. A secondary objective was to determine the relationship between these changes and the duration and severity of clinical manifestations of PD in this patient group. Twenty-six patients with early PD were recruited from the Movement Disorders Clinic at the Glenrose Rehabilitation Hospital in this case control study, matched for age and gender with 13 control subjects who were healthy and free of neurologic or psychiatric disease. Control subjects were recruited from patients’ friends and relatives and from the general university community. All patients fulfilled standard criteria for a clinical diagnosis of PD.13 None had been treated with levodopa or other dopaminergic medications. Clinical symptoms were rated with the Unified Parkinson's Disease Rating Scale (UPDRS)14 by two raters (M.W. and W.M.) 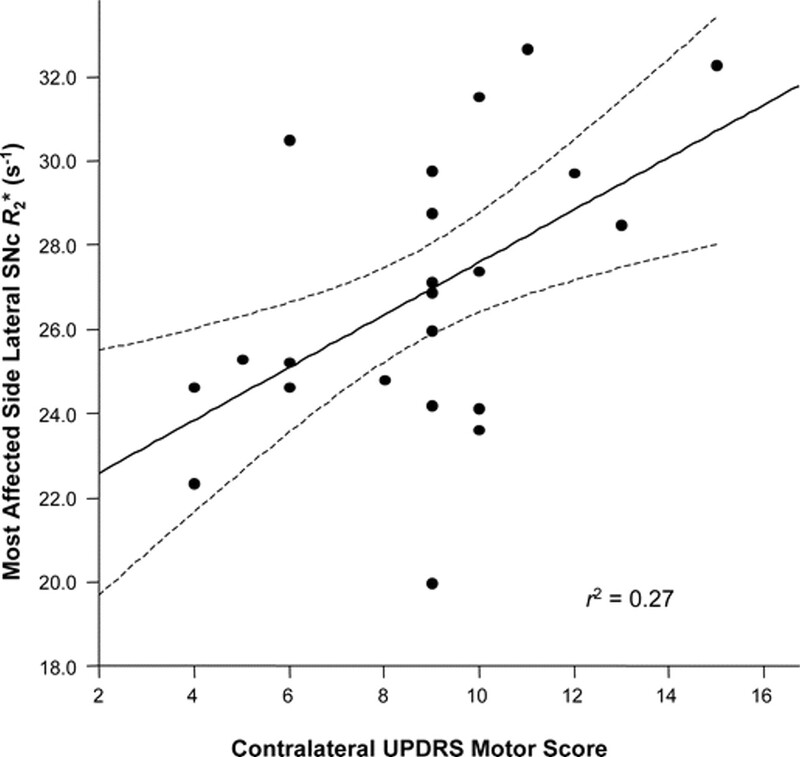 with a high inter-rater reliability (intraclass correlation coefficient for the total motor UPDRS = 0.99, determined in a separate group of patients with PD). The study was approved by the Human Research Ethics Board of the University of Alberta and all subjects gave informed consent. MRI data were acquired using a Magnex 3 tesla research magnet (Magnex Scientific Ltd., Abingdon, UK) with actively shielded gradients, controlled with a Surrey Medical Imaging Systems console (Surrey Medical Imaging Systems, Ltd., Guildford, UK). We used a multiple gradient echo sequence12 designed for rapid and optimal single-scan mapping of the proton transverse relaxation rate, R2* (R2* = 1/T2*). For each slice, a series of gradient echo images was acquired at echo times (TE) ranging from 5 msec to 55 msec in 10 msec intervals for a total of six images and a repetition time of 428 msec. Two sets of images were acquired with the aid of sagittal gradient echo scout images to guide slice placement. The first set consisted of four 5-mm-thick slices with the slice plane at 45° from a plane containing the anterior commissure (AC) and the posterior commissure (PC), as illustrated schematically in figure 1, with the PC placed approximately in the center of the slab of slices. From these images, the data for the substantia nigra and red nucleus were obtained. The second set of images consisted of five 5-mm-thick slices with the slice plane placed at 10° from the plane containing both the AC and PC (figure 1), also with the PC placed approximately in the center of the slice slab. From this second set of images, the data for the globus pallidus, putamen, caudate, and anterior white matter were obtained. For each set of images, the field of view was 300 × 300 mm2 with 128 × 128 data points acquired and with the matrix subsequently zero-filled to 256 × 256 points. The total time for the imaging procedure was approximately 30 minutes. 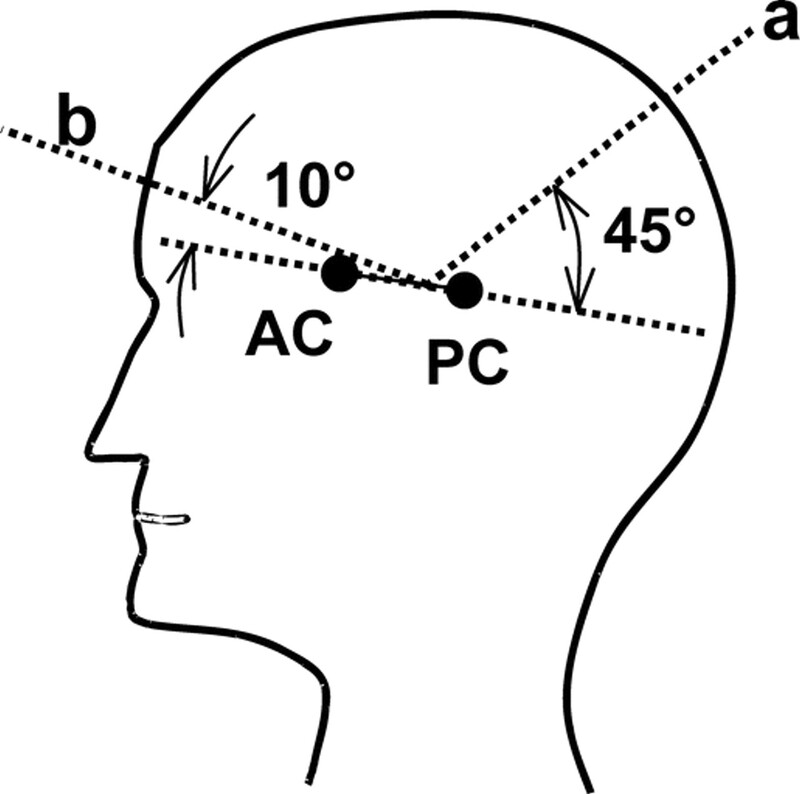 For the substantia nigra, four slices were placed parallel to the line labeled “a” and for the basal ganglia, five slices were placed parallel to the line labeled “b.” AC = anterior commissure; PC = posterior commissure. where M is the signal intensity for a particular voxel in the echo image acquired at TE and b is the intercept. In principle, b = 0 in this relationship; however it is included to improve the fit due to experimental variability. Region specific R2* values were measured by averaging the values obtained from the selected voxels. The investigator responsible for region-of-interest (ROI) analysis (M.G.) was blinded to subject group allocation. ROIs were drawn on the substantia nigra reticulata (SNr), SNc, and red nucleus, as shown in figure 2A. The SNr and SNc were subdivided into medial and lateral components (figure 2B). The SNr was identified as the band of low signal in the ventrolateral midbrain, while the region between the SNr and the red nucleus was considered to represent the SNc. In the forebrain, ROIs were drawn on the globus pallidus (GP), putamen, and head of the caudate nucleus, by reference to a standard neuroanatomic atlas15 as shown in figure 3A. GP and putamen were subdivided into anterior and posterior subregions (figure 3B) because of evidence that dysfunction in the posterior parts of these structures may be more closely related to the pathophysiology of PD.1,16,17 An additional ROI was placed on anterior white matter at the level of the genu of the corpus callosum. A typical image used for locating the substantia nigra is shown in (A), highlighting the substantia nigra pars compacta (SNc), substantia nigra pars reticulata (SNr), and red nucleus (RN). In (B), region of interest placement is shown. 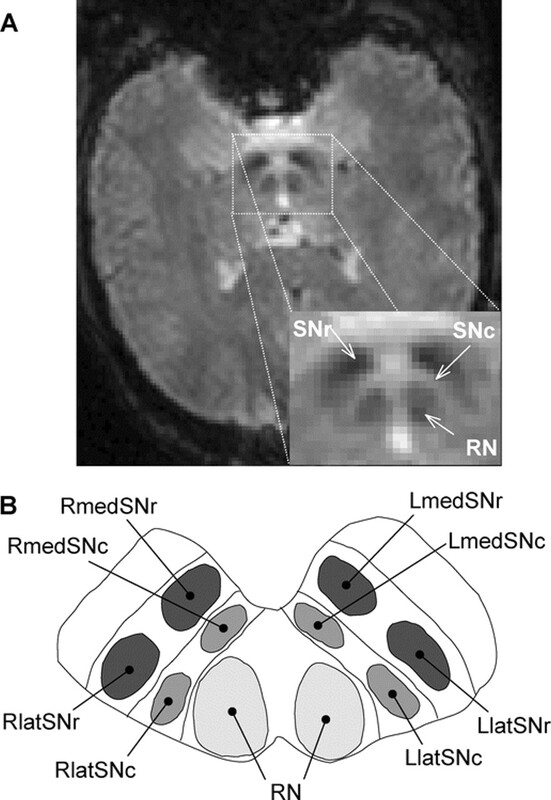 LmedSNr = left medial SNr; RmedSNr = right medial SNr; LlatSNr = left lateral SNr; RlatSNr = right lateral SNr; LmedSNc = left medial SNc; RmedSNc = right medial SNc; LlatSNc = left lateral SNc; RlatSNc = right lateral SNc. 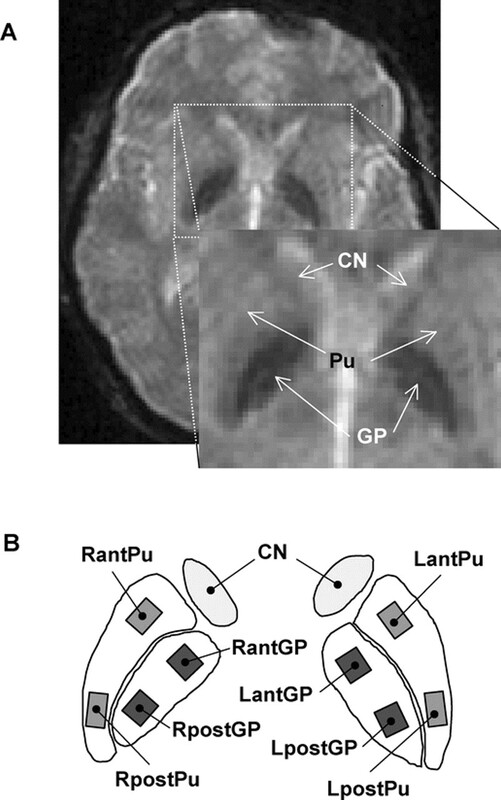 A typical image used for locating the basal ganglia is shown (A), highlighting the putamen (Pu), globus pallidus (GP), and caudate nucleus (CN). In (B), region of interest placement is shown. LantPu = left anterior Pu; RantPu = right anterior Pu; LpostPu = left posterior Pu; RpostPu = right posterior Pu; LantGP = left anterior GP; RantGP = right anterior GP; LpostGP = left posterior GP; RpostGP = right posterior GP. Patient and control demographics were compared using t tests and Fisher exact tests. Regional R2* values were compared between controls and patients for each region using independent t tests. A two-way analysis of covariance (ANCOVA) was then used to compare regional R2* values for controls and patients while controlling for gender and age. Lateralized motor scores were derived from the sum of lateralized features in the motor subscale of the UPDRS. Relationships between lateralized motor scores obtained from the most affected side and contralateral SNc (lateral ROI) R2* values were determined using linear regression. Values of r2, the square of the Pearson correlation coefficient, are reported. All statistical testing was performed with two-tailed tests and a 0.05 level of significance or 95% CIs. The sequentially rejective Bonferroni correction for multiple comparisons was applied to the p values. An extension of this method18 was used to correct the 95% CIs. Statistical analyses were performed using the SPSS® software version 14.0 for Windows (SPSS Inc., Chicago, IL). For midbrain images, one patient was excluded because the slice orientation was incorrectly set; three patients and two controls were excluded due to poor image quality resulting from subject movement and magnetic susceptibility effects. Therefore, MRI data for midbrain regions were analyzed from 22 patients with PD and 11 controls. For the forebrain sequences, one patient had incorrect slice orientation and two had poor quality images, so data from these images were analyzed from 19 patients with PD and 11 controls. Demographics and clinical status are summarized in table 1. There were no significant gender or age differences between patients and controls. In control subjects, we observed a positive correlation (r2 = 0.82, p = 0.01) between R2* and previously published regional iron concentrations19 as illustrated in figure 4. This supports our use of R2* as a viable MRI parameter for the noninvasive estimation of regional brain iron content. The values of R2* used in this plot are the means of regions of interest within each structure in the control group. SNr = substantia nigra pars reticulata; RN = red nucleus; Pu = putamen; GP = globus pallidus; CN = caudate nucleus; antWM = anterior white matter. Independent t tests showed a difference between controls and patients in the lateral SNc (p = 0.02), but in none of the other regions studied. After statistically adjusting for gender and age, differences in measured R2* values between patients and controls were observed in the lateral SNc (p ≤ 0.005). The lateral SNc opposite the most affected limbs showed the greatest increase in R2* in patients with PD (p < 0.02). The R2* values, statistically adjusted for gender and age, with 95% CIs of the differences between controls and patients for all substantia nigra and basal ganglia structures, are listed in table 2. There were no significant gender-related differences. There was an association between the lateralized motor score from the clinically most affected side and R2* values obtained from the opposite lateral SNc (r2 = 0.27; p = 0.01). The relationship between lateral SNc R2* values and contralateral motor score from the most affected side is illustrated in figure 5. No significant relationship was observed between lateralized motor scores and any of the other midbrain regions. In the forebrain, there was an association between the lateralized motor score from the clinically most affected side and R2* values from the opposite posterior GP (r2 = 0.31; p = 0.01), but no other basal ganglia regions. The regression line was determined with the least squares method to the patient data (solid line); the 95% CI is indicated (dashed lines). There were no significant relationships between R2* and either the total (non-lateralized) UPDRS motor score or the number of years since the onset of clinical symptoms in any of the ROIs considered. We utilized high field MR imaging to quantify R2* as an estimate of regional iron content in basal ganglia substructures in patients with early, mild PD, who did not require symptomatic treatment. Our observations indicate the presence of increased R2* in the lateral SNc in this patient group. In controls, we observed a very close relationship between R2* and previously reported direct measurements of regional iron content, supporting our use of this parameter as an estimate of regional brain iron. Our observation that the lateral SNc is most affected is consistent with previously published neuropathologic evidence of selective degeneration affecting neurons of the SNc of patients with PD, with the degeneration being greatest in the ventrolateral and least in the dorsomedial subregions.1 These authors also postulated a presymptomatic period during which there is progressive neuronal loss from the SNc, indicating that the pathologic process may be well underway prior to the time of PD diagnosis. This is consistent with our observation of lateral SNc changes even in patients with very early PD whose symptoms had not yet reached sufficient severity to require pharmacologic treatment. The degree of nigral pathology is generally assumed to correlate with the severity of clinical disease measures. This is consistent with our observation that lateralized motor scores from the most severely affected limbs correlated with contralateral SNc measurements. We did not observe a significant correlation on the least affected side, most likely due to the fact that our patients had relatively mild symptoms with a limited range of values in the clinical disease severity scores derived from that side. Our average R2* value in controls for the SNr (which corresponds best to the region identified in a previous publication9 as the SN) was 39.9 ± 5.0 s−1, which agrees with results in this previous report of 37.4 ± 3.5 s−1 and with the value of 35.7 s−1 calculated from the data reported elsewhere by another group.20 In contrast, R2* in our patient group was significantly lower than in the patient group in the former report9 (37.1 ± 5.0 s−1 as compared to 52.4 ± 7.8 s−1). These patients had a longer disease duration than our patient group, raising the possibility that SNr iron content may become affected in later disease, whereas SNc is predominantly affected in early disease. Although we used effective transverse relaxation (R2*) measurements as estimates of regional iron content, this is still an imperfect tool. R2* is a combination of transverse relaxation (R2 = 1/T2) and magnetic field inhomogeneity, with tissue iron being a major determinant of the latter. Gradient echo imaging sequences are particularly sensitive to the signal-reducing effects of tissue iron-induced local field inhomogeneities because, unlike spin echo sequences, they do not utilize a refocusing pulse. While tissue iron content is a major determinant of R2*, this MR parameter may also be affected by other factors, including magnetic field inhomogeneities arising from tissue-tissue and air-tissue interfaces, where the difference in magnetic susceptibility between two substances gives rise to a magnetic field gradient across the interface. The MR sequence used in the present study12 was designed to mitigate the contribution from this source of magnetic field inhomogeneity and thus minimize its effect on the measured R2* values. Identification of the substantia nigra on MR images has been an important source of variability in previous studies, with many reports not considering the nigral subdivisions of SNc and SNr. In the present study, we considered the SNc to be located in the high signal area interposed between the low signal intensity structures of the SNr and the red nucleus. A previous study suggested that proton density or short inversion time inversion recovery images may be preferable to T2-weighted images for identification of the SNc21; their localization corresponded very closely to the localization that we used with our T2*-weighted technique. The MR definition of the SNr is not entirely clear,21 but as in several previous studies, we considered it to correspond to the low signal area in the ventrolateral midbrain. Studies of the three-dimensional structure of the SNc have indicated a complex organization with clusters of tyrosine hydroxylase positive neurons extending into the SNr.22,23 This fine structure is well beyond the resolving capability of our 3 tesla imaging system (in-plane resolution 2.4 mm). There are previous reports of T2 (1/R2) measurements made in the SN of patients with PD.24–27 However, as pointed out by Haacke et al.,28 although T2 is strongly affected by iron concentration, the water content of brain tissue also has a significant influence. Quantitative T2 measurements are therefore of limited value in detecting iron-related structural pathology. Unlike previously reported studies,10 we did not observe a significant association between clinical features and R2* in most other basal ganglia structures. This may be due to the fact that our patients had early disease with 12 of our patients having UPDRS motor scores ≤12. As a result of our concentration on early disease, there was a limited range of clinical disease severity scores in our patient group. We did observe a correlation with clinical symptoms in the posterior GP contralateral to the most severely affected limbs, but it is difficult to make too much of this correlation considering that the posterior GP values were no higher in patients than in controls. The association between R2* values obtained from the lateral SNc and clinical indicators of disease severity in untreated patients with early PD suggests the potential utility of these measurements as a biomarker of disease progression. This was a cross sectional study, however, and does not provide direct information regarding disease progression. Longitudinal studies are currently underway using a within subjects experimental design to determine whether there may be a relationship between the increasing motor symptomatology associated with progression and evolving regional R2* measurements. The authors thank the subjects for their willing cooperation, and Richard Camicioli and Allyson Jones for critical review of the manuscript. e-Pub ahead of print on January 2, 2008, at www.neurology.org. Supported by the Canadian Institutes for Health Research. Received April 14, 2007. Accepted in final form August 8, 2007. Fearnley JM, Lees AJ. Ageing and Parkinson's disease: substantia nigra regional selectivity. Brain 1991;114:2283–2301. Earle KM. Studies on Parkinson's disease including x-ray fluorescent spectroscopy of formalin fixed brain tissue. J Neuropathol Exp Neurol 1968;27:1–14. Dexter DT, Wells FR, Lees AJ, et al. Increased nigral iron content and alterations in other metal ions occurring in brain in Parkinson's disease. J Neurochem 1989;52:1830–1836. Sofic E, Riederer P, Heinsen H, et al. 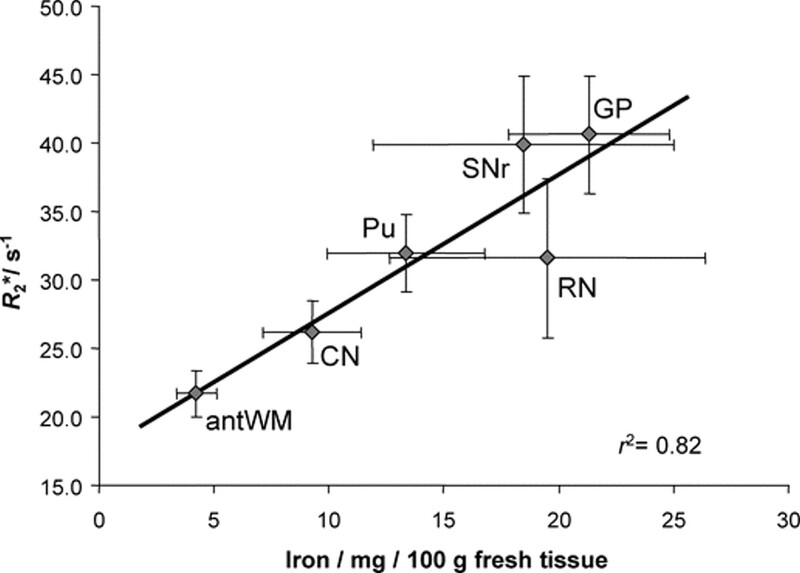 Increase iron (III) and total iron content in post mortem substantia nigra of parkinsonian brain. J Neural Transm 1988;744:199–205. Youdim MBH, Ben-Schachar D, Yehuda S, Riederer P. The role of iron in the basal ganglia. Adv Neurol 1990;53:155–162. Martin WRW, Ye FQ, Allen PS. Increasing striatal iron content associated with normal aging. Mov Disord 1998;13:281–286. Ye FQ, Allen PS, Martin WRW. Basal ganglia iron content in Parkinson's disease measured with magnetic resonance. Mov Disord 1996;11:243–249. Ordidge RH, Gorell JM, Deniau JC, et al. Assessment of relative brain iron concentrations using T2-weighted and T2*-weighted MRI at 3T. Magn Reson Med 1994;32:1138–1143. Gorrell JM, Ordidge RJ, Brown GG, et al. Increased iron-related MRI contrast in the substantia nigra in Parkinson's disease. Neurology 1995;45:1138–1143. Graham JM, Paley MNJ, Grunewald RA, Hoggard N, Griffiths PD. Brain iron deposition in Parkinson's disease imaged using the PRIME magnetic resonance sequence. Brain 2000;123:2423–2431. Ye FQ, Martin WRW, Allen PS. Estimation of brain iron in vivo by means of the interecho time dependence of image contrast. Magn Reson Med 1996;36:153–158. Wild JM, Martin WRW, Allen PS. A multiple gradient echo sequence optimized for rapid, single scan mapping of R2* at high B0. Magn Reson Med 2002;48:867–876. Calne DB, Snow BJ, Lee C. Criteria for diagnosing Parkinson's disease. Ann Neurol 1992;32(suppl):S125–S127. Fahn S, Elton RL. Unified Parkinson's Disease Rating Scale. In: Fahn S, Marsden CD, Goldstein M, Calne DB, eds. Recent developments in Parkinson's disease, vol. 2. Florham Park, NJ: Macmillan Healthcare, 1987;153–163. Talairach J, Tournoux P. Co-planar stereotaxic atlas of the human brain: 3-dimensional proportional system: an approach to cerebral imaging. New York: Thieme Medical Publishers, 1988. Kish SJ, Shannak K, Hornykiewicz O. Uneven pattern of dopamine loss in the striatum of patients with idiopathic Parkinson's disease: pathophysiologic and clinical implications. N Engl J Med 1988;318:876–880. Laitinen LV, Bergenheim AT, Hariz MI. Leksell's posteroventral pallidotomy in the treatment of Parkinson's disease. J Neurosurg 1992;76:53–61. Ludbrook J. Multiple inferences using confidence intervals. Clin Exp Pharmacol Physiol 2000;27:212–215. Hallgren B, Sourander P. The effect of age on the non-haemin iron in the human brain. J Neurochem 1958;3:41–51. Gelman N, Gorell JM, Barker PB, et al. MR imaging of human brain at 3.0 T: preliminary report on transverse relaxation rates and relation to estimated iron content. Radiology 1999;210:759–767. Oikawa H, Sasaki M, Tamakawa Y, Ehara S, Tohyama K. The substantia nigra in Parkinson disease: proton density-weighted spin-echo and fast short inversion time inversion-recovery MR findings. Am J Neuroradiol 2002;23:1747–1756. Damier P, Hirsch EC, Agid Y, Graybiel AM. The substantia nigra of the human brain. I. Nigrosomes and the nigral matrix, a compartmental organization based on calbindin D28K immunohistochemistry. Brain 1999;122:1421–1436. Morel A, Loup F, Magnin M, Jeanmonod D. Neurochemical organization of the human basal ganglia: anatomofunctional territories defined by the distributions of calcium-binding proteins and SMI-32. J Comp Neurol 2002;443:86–103. Vymazal J, Righini A, Brooks RA, et al. T1 and T2 in the brain of healthy subjects, patients with Parkinson disease and patients with multiple system atrophy: relation to iron content. Radiology 1999;211:489–495. Antonini A, Leenders KL, Meier D, Oertel WH, Boesiger P, Anliker M. T2 relaxation time in patients with Parkinson's disease. Neurology 1993;43:697–700. Ryvlin P, Broussolle E, Piollet H, Viallet F, Khalfallah Y, Chazot G. Magnetic resonance imaging evidence of decreased putamenal iron content in idiopathic Parkinson's disease. Arch Neurol 1995;52:583–588. Bartzokis G, Cummings JL, Markham CH, et al. MRI evaluation of brain iron in earlier- and later-onset Parkinson's disease and normal subjects. Magn Reson Imaging 1999;17:213–222. Haacke EM, Cheng NYC, House MJ, et al. Imaging iron stores in the brain using magnetic resonance imaging. Magn Reson Imaging 2005;23:1–25.